I only had a vague knowledge of the epic poem The Shahnameh (the Book of Kings) as a critical work in Persian/Iranian culture……but the evening in Perranporth Memorial Hall that Adverse Camber presented their show of the stories and the music of that world brought all sorts of insights, exotic worlds and memories. The hall was thronging …evidently Persian storytelling a subject to draw Cornish audiences on a cold March evening. 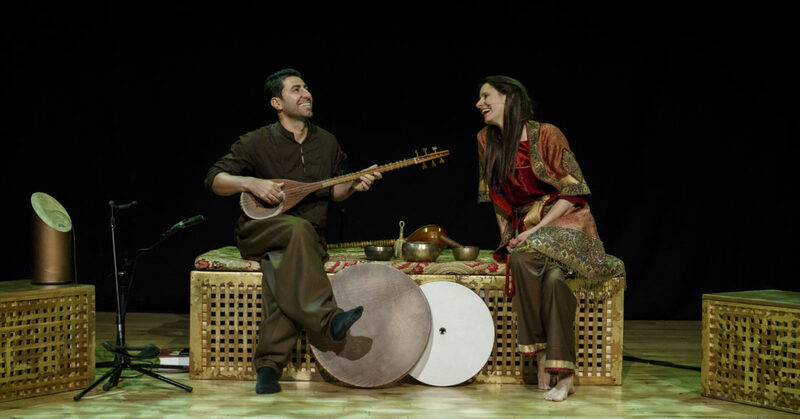 Two performers, Xanthe Gresham Knight, a storyteller, and Arash Moradi, musician conjured the exotic and dazzling world of the Persian Book of Kings. The stories were collected and written over thirty years at around 1000 AD by the poet Ferdowsi and the epic poem consist of 50000 lines of verse in rhyming couplets (distychs) in Farsi. The audience is drawn in as partners into telling the exotic stories of the great God Ahura-Mazda and the heroes of the Persian princesses and heroes: Rustam; Zal; Rudabeh; the mythical bird the Simorgh; Tahmina, Rakhsh – the Horse of Rustam; Sohrab, Bizan of Iran and Manizeh of Turan; The Demons and Shapeshifters.